Continued to stop at any place marked as a lookout. 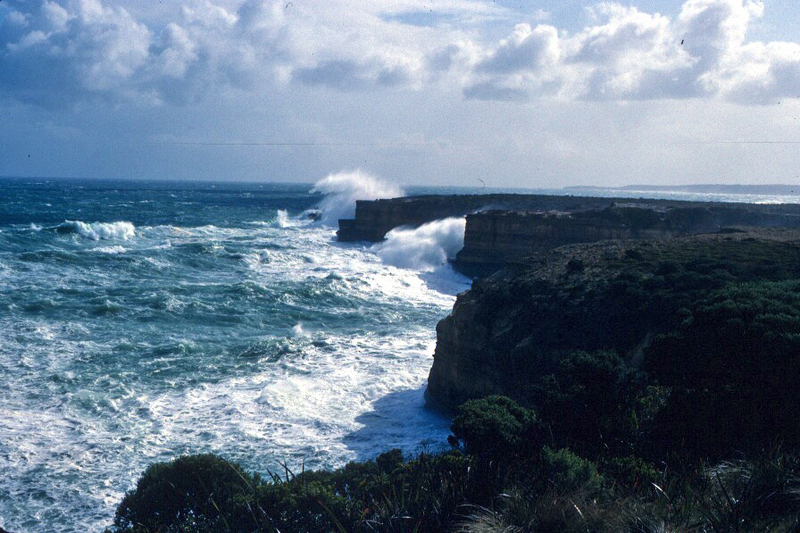 At many of these, including the at the Twelve Apostles, when I reached them, the salt spray from the waves far below was being whipped by the wind up over the cliff edges. And in some places, the waves themselves were topping the cliffs. It was too beautiful to leave, so I ended up fairly drenched. What an amazing place. 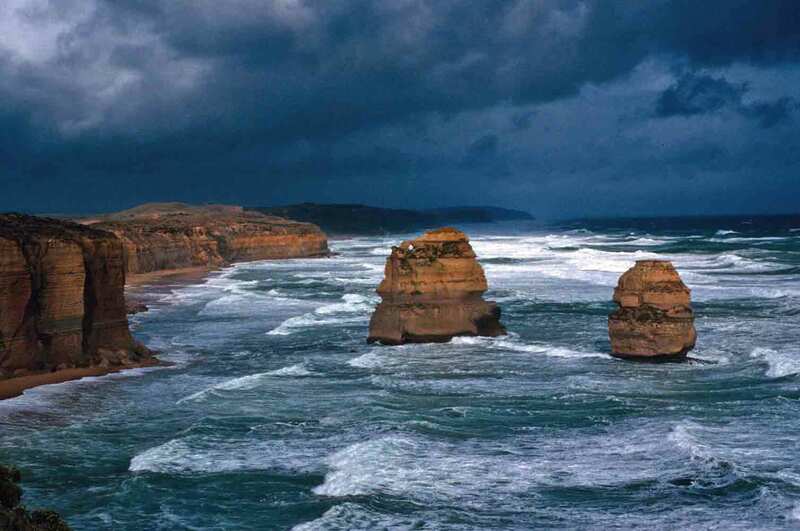 The Twelve Apostles is probably the most famous of the rock formations along the Great Ocean Road, even though only nine of the twelve rock pillars remain standing. It is the last of the great, towering formations along the Great Ocean Road, and the closest to a major city (an easy weekend away from Melbourne). 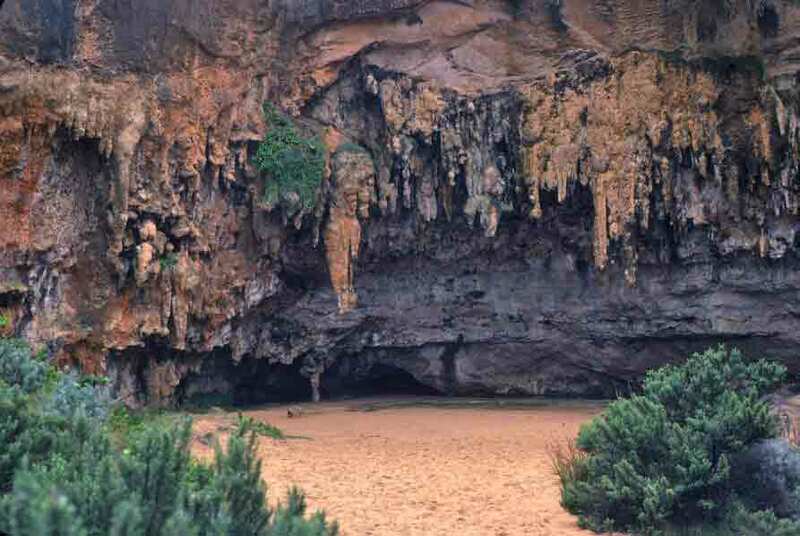 These and the other formations are reminders that erosion has been the main shaping force, at least for the last few millions years, of Australia’s landscape. Finally, the road turned inland, climbing into the Melba Gully rainforest and then into the mountains of the Otway National Park. Here, the scenery alternated between wild moors, forested mountains, and rolling sheep paddocks. A light snow began as I climbed higher. At Laver Hill, I stopped at the charming Blackwood Gully Tearoom, owned by the daughter of a woman I met at Binna Burra, near the beginning of this trip. The daughter wasn’t in, but the weather had turned ugly, so I pulled a chair up to the fireplace and gazed out the picture windows over the mountains as I enjoyed a pot of tea and bushman’s pie for a late (4:00pm) lunch. Then, back into what was becoming an actual blizzard. I headed down the far side of the range, through dense, beautiful forests of eucalypts and tree ferns. As I left the mountains and neared the coast, the clouds began to part. 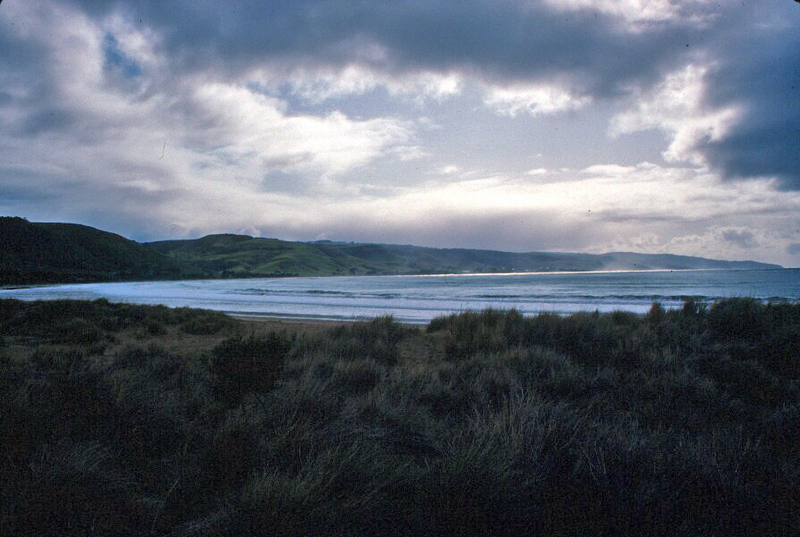 It was a bright early evening as I pulled into Apollo Bay and began my search for accommodations. No funky, old hotels here. Just as well, since I’m cold, wet, covered with sand and dried salt spray, and just as glad to pay a bit more for a nice motel with attached bath and a heater in the room, plus a TV and tea making facility. Also, I’m just across the street from the beach, and they say the sunrise here is beautiful. Actually, probably because of stiff competition during the summer season, when people from Melbourne flood to the area for fun in the surf or the nearby mountains and rock formations, the Apollo Bay Hotel-Motel is quite nice, and would probably cost a lot more in finer weather. The walls are wood paneled and the ceiling is woven grass of exactly the same golden color as the wood, with a handsomely tiled bathroom–that I don’t have to walk down the hall to reach. Soon, I was clean, cozy, warm, and dry, after a wild, wet, but glorious day. Not a bad way to end a day of wonders. What an amazing stretch of land this is! 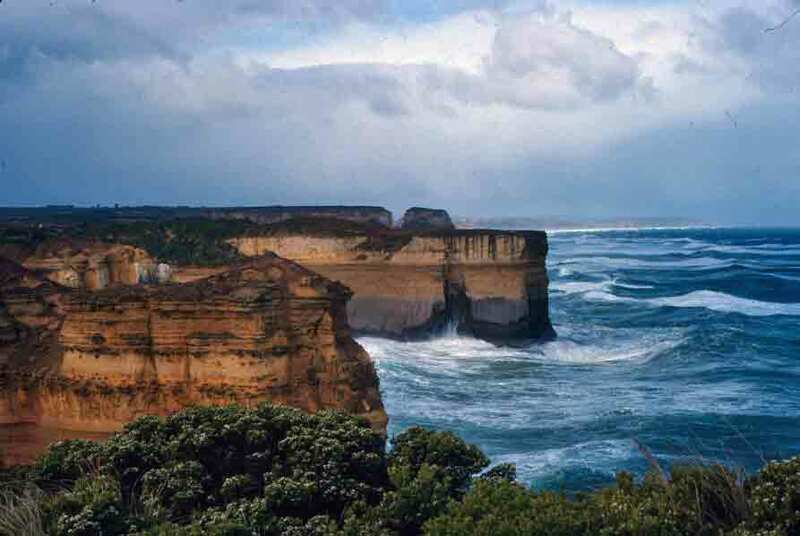 The coast might be horrific for navigation in wooden ships, but driving the Great Ocean Road and seeing it from land, it was breathtaking, with miles of high, craggy cliffs carved by crashing waves. 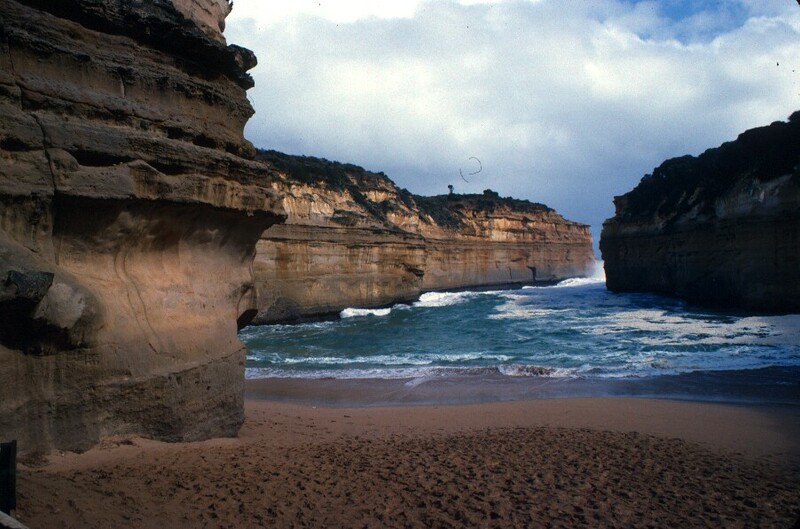 The wind and waves actually suit the place, as the coast and its rock formations look fairly untamed. Plus the wind kept things moving, so while rain occasionally fell, there were also bursts of sunlight and blue sky, as the gray, black, and white clouds churned through the sky. The wind was sufficiently wild that I was occasionally concerned about the possibility of being blown off a cliff, but I still tackled each “scenic lookout” I reached. First stop, the Bay of Islands, then on to London Bridge. At London Bridge, the wind was so wild that, though the cliffs are hundreds of feet high, there was a “blizzard” of sea foam falling on the vegetation around me–and on my camera, which I had to clean every few minutes. London Bridge used to connect to the mainland, but I’ve read that several years ago, just after a group of tourists had strolled out to the seaward end, the connection to land collapsed. No one was hurt, but the visitors had to be rescued by helicopter. 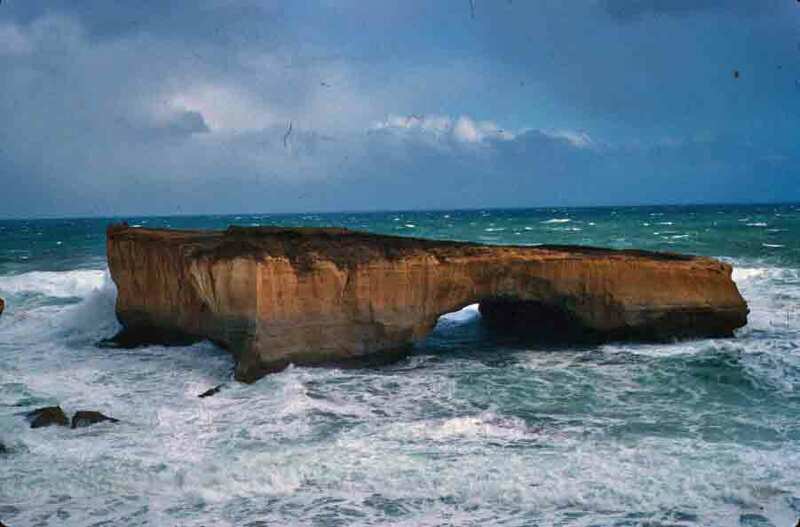 The Arch and Port Campbell followed London Bridge, the Blow Hole and Thunder Cave, and then on to Loch Ard Gorge. In the parking area for Loch Ard Gorge, I paused for a bit, while a particularly wet and violent squall swept over me. Then, once things calmed down again, I took advantage of the stairway installed here to climb down to water level. Splendid and beautiful, and suddenly calm enough to make it hard to believe how wild it had been minutes earlier. Though impressive, it also made it clear that this would be an intimidating place to be shipwrecked, as there is no easy way upward without the quite new stairway I’d used. From this vantage point, I could also see how the continued erosion from crashing waves was undercutting the cliffs, which will someday fall or become additional arches and bridges. Loch Ard Gorge was named for the clipper ship, the Loch Ard (the one from which the previously mentioned porcelain peacock was rescued), which was wrecked nearby. After exploring the gorge, I hiked to the nearby Loch Ard Cemetery, where those who did not survive were buried. There, I saw a flash of blue in a shrub and turned to see a jewel-like splendid blue wren perched there. What a delight. Then it was on the road again, heading for the Twelve Apostles. The wind was becoming so wild that it made it difficult to walk, and even made it difficult to drive at times. However, the coast was of such astonishing grandeur and beauty that I could not imagine letting the weather deter me. Plus it added a bit more drama to the stunning scenery. (Though I wouldn’t mind trying milder weather someday.) As I continued on, the combination of rain and light offered me a treat in the form of a rainbow over the ocean. I love rainbows, so this seemed like a special gift, even in the midst of such a remarkable day. 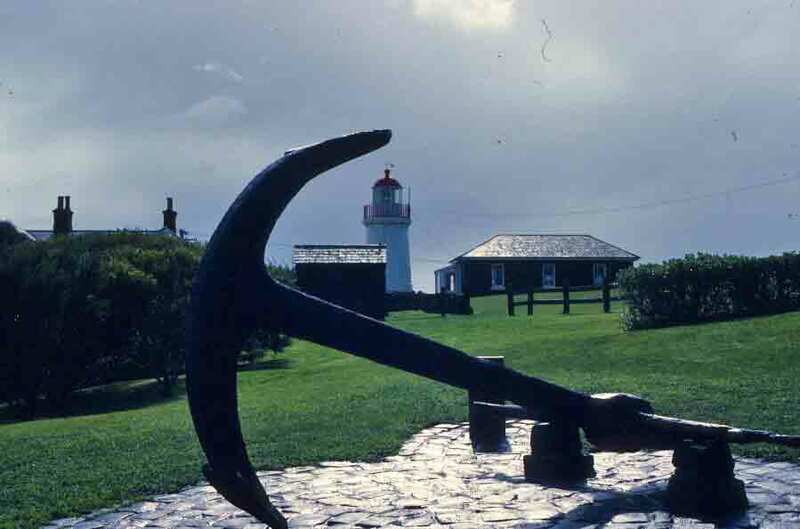 My destination in Warnambool was the Flagstaff Hill Maritime Village, a museum and recreated shipping village of the late 1800s, built on the site of gun emplacements that were originally set up to protect the coast and its fleet from Russian pirates. If you saw the movie “Quigley Down Under” (a movie with a fun soundtrack but more flaws of geography and reality than I could comfortably withstand, despite my loving Tom Selleck and Alan Rickman), you will have seen this location, as it was used for the street scene when Quigley first arrives in Australia and disembarks his ship (and immediately gets into a fist fight). I love “living history” in any form, and while the village was relatively quiet, as it is currently off season, it as still a delight. I wandered through all the buildings, learning all I could of sailing fleets, shipping-related skills, the businesses that surrounded and supported shipping, and this area’s history. Next, I walked to the museum, which is home to the state’s largest accessible collection of shipwreck artifacts. Both fascinating and heart rending, items that had been salvaged from sunken ships or washed ashore along the “Shipwreck Coast” are reminders of the people and dreams that were lost, along with the ships. Along this 80-mile( 130-kilometer) stretch, more than 80 ships have gone down. A lot of the ships were cargo vessels, so there was not always a stunning loss of life, with the worst and most famous being the sinking of the S.S. Admella in 1959, when 89 people died. But still, each wreck represented loss on many levels. There were thousands of artifacts, including tools, belt buckles, ships’ tackle, crockery (some broken, some in remarkably good condition), clothing, cutlery, bottles, furniture, shoes, silver goblets, cooking utensils, and vastly more. A really handsome, square-cut diamond ring caught my eye, beautiful despite being heavily encrusted. But everything was intriguing or evocative, and memorable for the tales it told of life in the days of wooden ships. 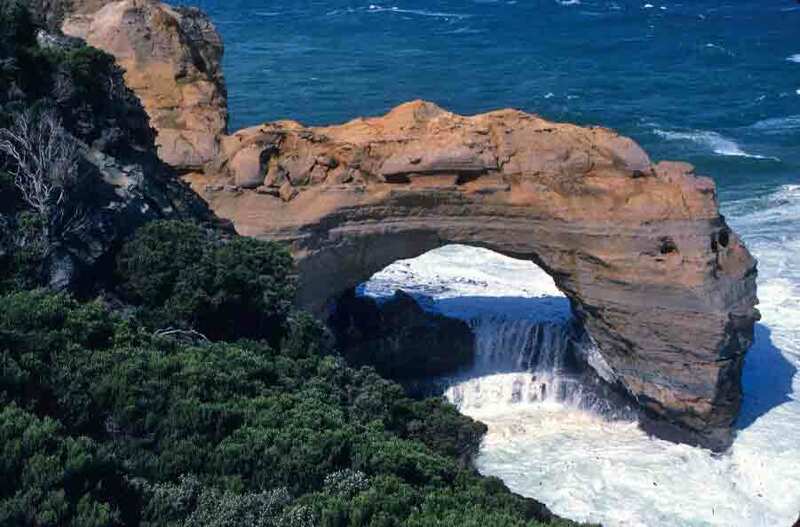 I still had a lot to see along the coast, so I finally tore myself away from the museum and, with a quick stop in the gift shop to buy a booklet about the place, I continued on, heading now for the Great Ocean Road. The wind was wild when I arose, but there was sun peeking through in places, sneaking a few beams of light in between bursts of rain. Not ideal, but it seemed more promising than yesterday’s steady rain. After the breakfast included in my room charge, I started my day with a driving tour around Port Fairy. Charming little town, where the wide streets are lined with buildings from the 1800s–50 of them registered with the National Trust. 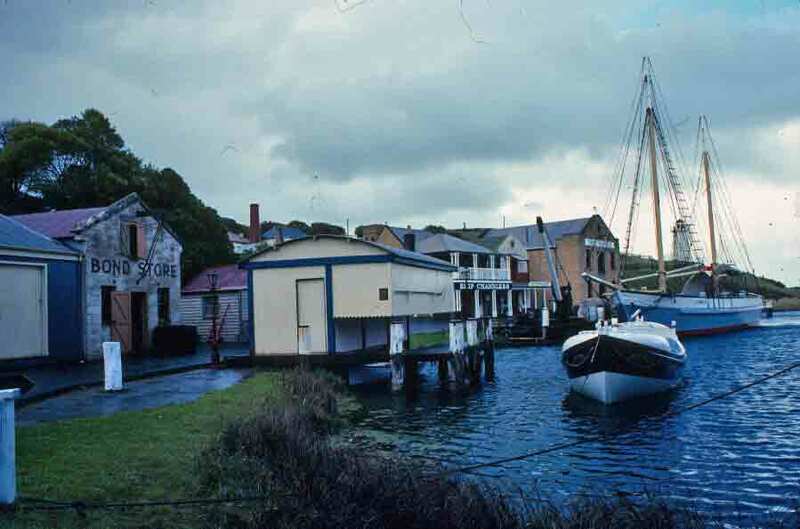 Fishing is the main business in town, though proximity to the Great Ocean Road makes it popular for tourists, as well. Even in less than ideal weather, I enjoyed it, snatching photos between gusts of wind and bursts of rain. Then it was time to head back to Highway 1. I turned off the highway at Tower Hill, a state park that is, contrary to images the name might suggest, a giant crater from a volcano (now inactive) that erupted an estimated 30,000 years ago. 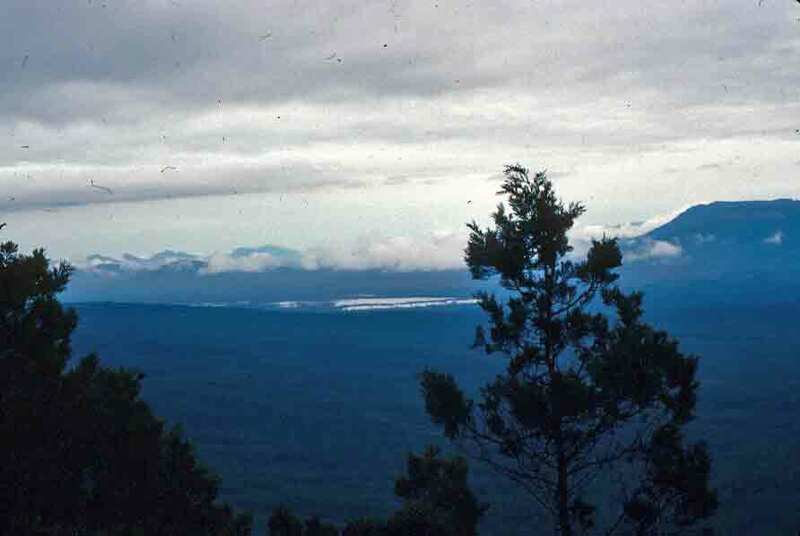 Lakes and islands fill the broad crater, which is known for its wildlife. As was the case yesterday, in the Grampians, due to the blustery weather, I was alone, as I headed along the narrow road that winds among the trees in the massive caldera. It was raining pretty steadily by this time, so I couldn’t really get out and wander, which is a shame, as it is a beautiful area. I did get a few photos, but mostly I just enjoyed the greenery and the remarkable amount of birdlife. 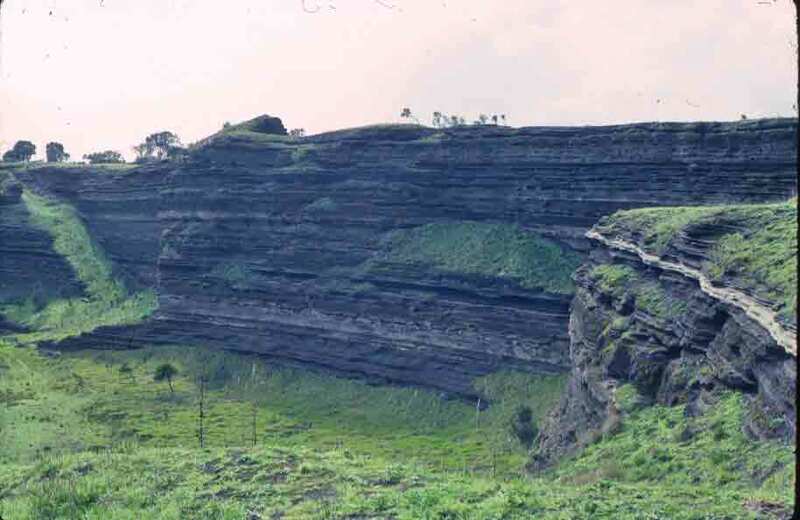 As I drove down into the crater, through the forests, and among the waterways, I enjoyed seeing swallows, Cape Barren Geese, black swans, and other birds. At one point, I found the road blocked by a tree that had been downed by the wild wind. This might not seem like a major problem, but the single-lane, one-way road is very narrow and the trees are close on either side. I had to drive in reverse for about a quarter mile–which made my being alone on the road very welcome. Can’t imagine having to back up a whole line of cars. Fortunately, after that quarter mile, there was a parking area that offered not only a bit more space to maneuver, but also an alternative exit, so I could get around the tree, and didn’t have to back up the several miles to the entrance. That would have been distressing. Climbing out of the crater once again, I circled its rim, passing through Koroit, a small, old town considered to be one of the country’s best examples of an early Irish settlement. Then it was back on Highway 1 again, headed for Warnambool. 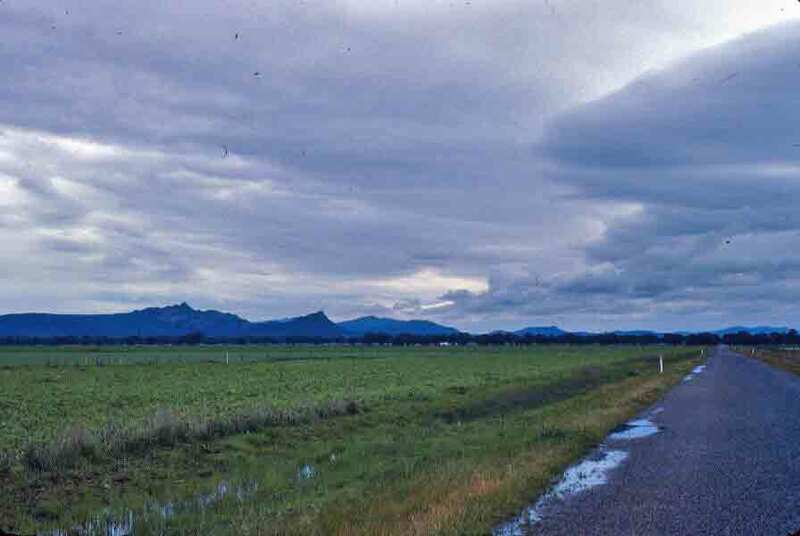 Nearing Dunkeld, I saw Mount Abrupt for a moment, but then the clouds closed in, and the peak vanished amid the cottony grayness. I now headed for the coast, as the rain began in earnest. I think my “short cut” across country ended up not saving any time, but I passed through a lot of very pretty farmland and still managed to reach Port Fairy by 4:30. 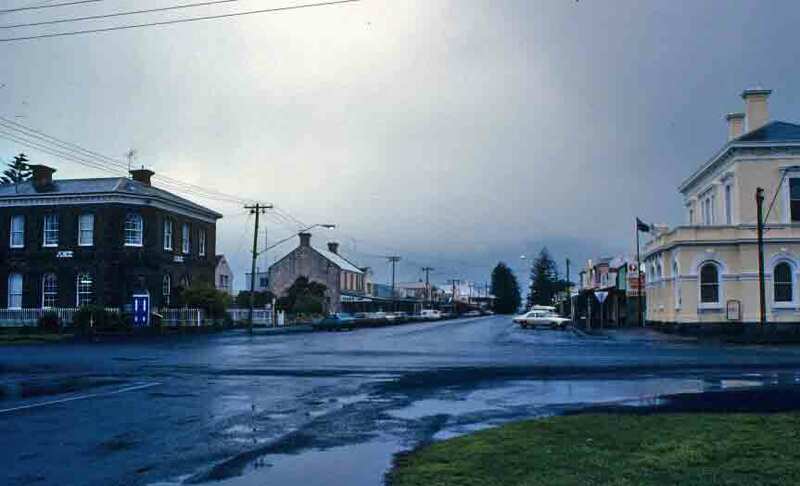 In Port Fairy, I headed down the main street, looking for accommodation. In short order, I hit upon the charming old (1855) Commercial Hotel. This place is a gem. Wooden veranda, heaps of antiques, leaded glass, and a bigger, nicer bedroom than at last night’s stop. This is a much smaller town (2,000 vs. Horsham’s 12,000), so I can only imagine that its location along the coast creates more income, making possible the better condition of the hotel. 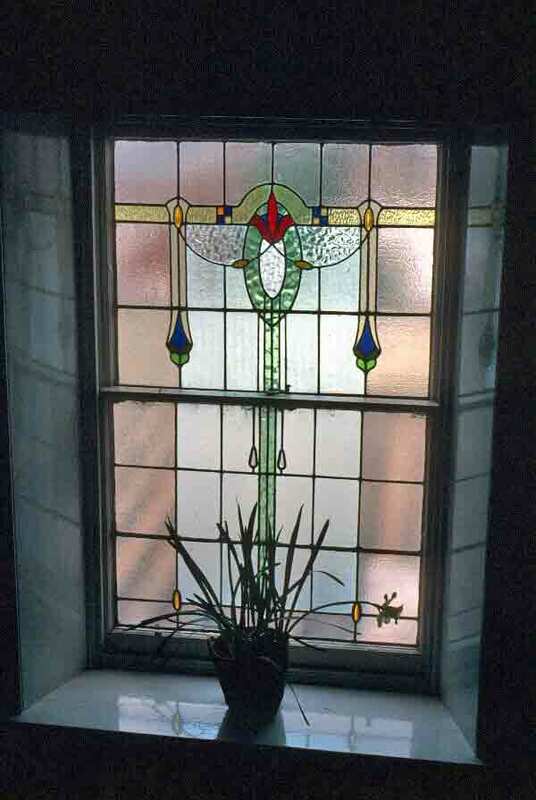 I was delighted with my gracious, antique-filled room. Despite my love of the older objects in the room, I was pleased to see an electric blanket was provided. It has turned quite cold, and that combined with the dampness makes this bit of modern technology rather welcome. Not particularly interested in wandering the streets in the still pouring rain, I opted for dinner at the hotel. That proved to be a good choice. Because I was in a seaside location, I naturally ordered the seafood platter: squid, bay scallops, prawns, and whiting, all fried but all astonishingly fresh. I was the only woman and only American (accent keeps giving me away) in the restaurant, and wanderers from other lands always interest Australians. They like to make sure you see the best of their parts of the country, and two men at the next table were no exception. So, by the end of my meal, I had considerably more information about tomorrow’s onward drive. Upstairs in my room, as I settled in for the night, I could hear the wind picking up. It was wild enough to bring to mind that this area is known as the “shipwreck coast.” The sound varied between mournful and threatening. I can’t imagine navigating these waters in that kind of wind. 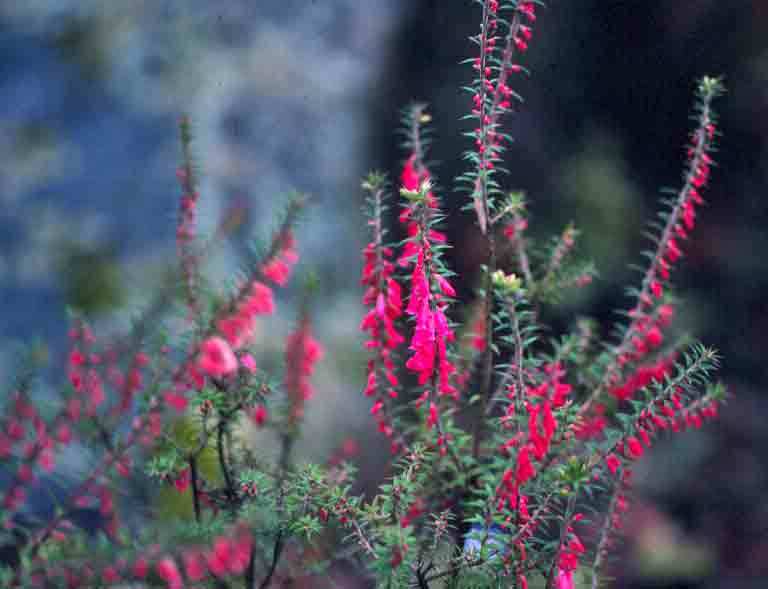 Then onward, to Boroka Lookout–a bit farther off the main drag, down a road lined with wildflowers in white, a dozen shades of pink (including the lovely Common Heath, state flower of Victoria), and the familiar yellow of the wattles. 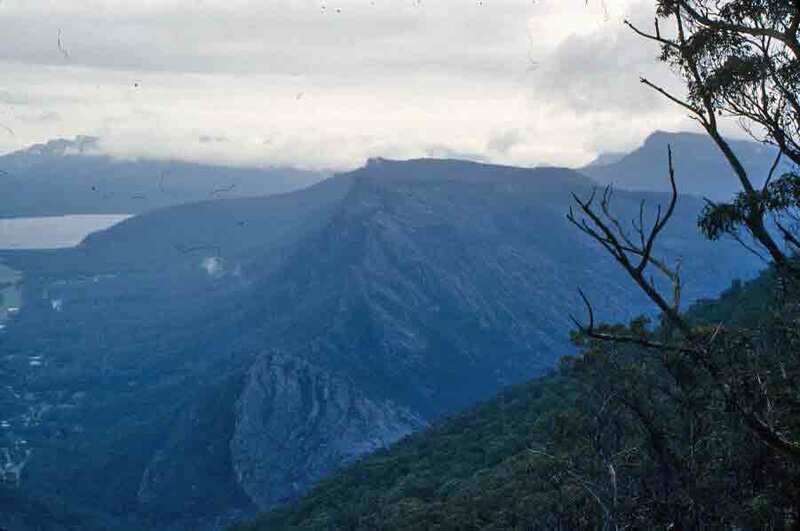 Here, the view was down across Halls Gap and the Wonderland Range, and the avian delight here was a sparrow-sized bird with a brilliant orange breast. 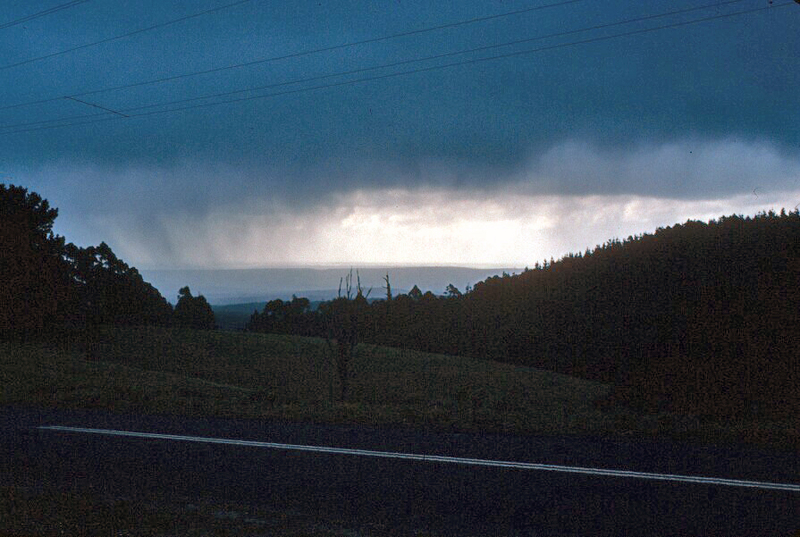 Half an hour later, I was winding down toward Halls Gap, through the Wonderland Range. This is a truly beautiful, craggy, wild area. (Which, besides being gorgeous, also makes driving “interesting.” Wet, winding road, and I’m on the “wrong” side. Definitely part of the adventure.) I passed the Elephant’s Hide and Indian Head (rock formations that really do match their names), stopping to admire them, and then dropped down into Halls Gap. It was after 1:00pm, so I parked the car and walked along the main street to Stony Creek. The Flying Emu Café offered tables overlooking the creek, so I decided it would be a good for lunch. After eating, I popped into the craft store next door and bought a T-shirt for my sister-in-law. Then it was back to the car and onward. Now I headed south, driving the entire length of the Grampians National Park, emerging an hour later at Dunkeld. On this stretch of road, I had the wilderness to myself. No other cars interrupted the silence on this dark, damp day. It was splendid: just me and the trees and the rain. I was delighted almost to giddiness by kookaburras, laughing and flying past, and kangaroos hopping across the road. At one spot, I saw a kangaroo hesitate and look back, and I read this as a signal that others would follow, so I stopped the car. 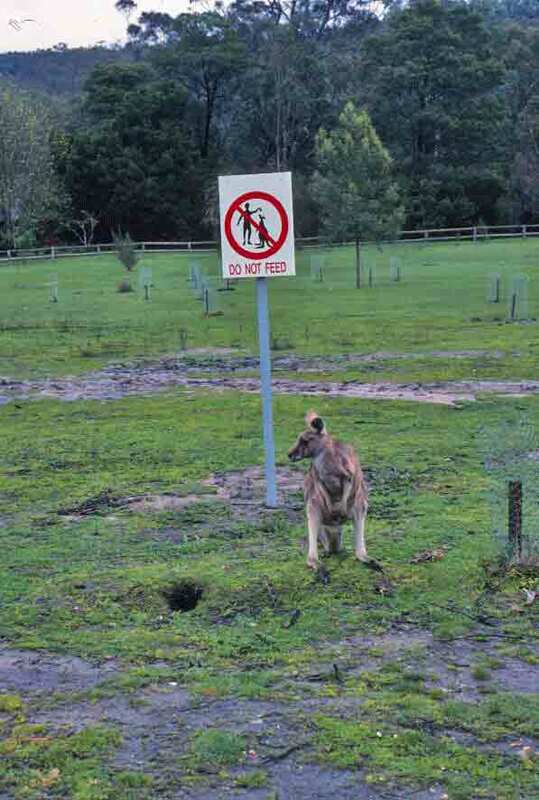 A few seconds later, the first ‘roo was followed by several others. I waited until nearly a dozen kangaroos of varying ages and sizes had safely crossed the road before I continued on. Breathtaking. I woke to the sound of rain. Overcast, damp, and chilly outside. Self-serve continental breakfast. Got my food and a table, then began looking around, admiring the old room. A man at the next table (bearded, probably mid-40s) noticed me studying the room and began talking to me. He was born and raised in Horsham, and he knew a fair bit about the hotel’s history–which he was delighted to share. 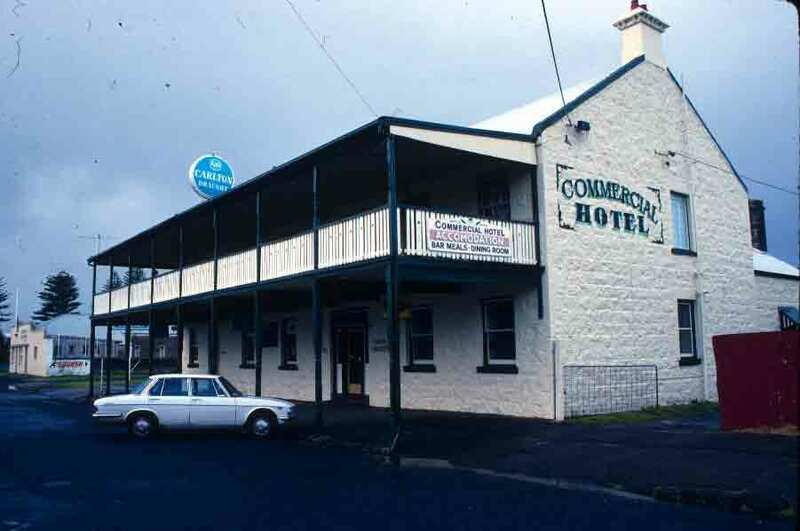 Built in 1872, the hotel originally had the graceful verandas and iron lace one sees on so many outback hotels, but the city council thought the veranda posts would be dangerous when parallel parking was established, since the posts were right at the edge of the sidewalk, and cars might hit them. So the posts were torn off and the veranda vanished. There is a group, however, trying to get the verandah put back. An old black and white photo of the hotel was produced, and it definitely was lovelier with the veranda. There were originally eleven fireplaces, several of which were destroyed when walls were knocked out to enlarge the public rooms. But the ones that remain are attractive and the wood paneling and great, divided stairway, with its broad banisters, are still handsome. With a little tender loving care, this could be a truly lovely place once again. Past Green Lake, I turned right and headed towards the mountains. The forest closed in around me, and the road began to wind and rise. Before an hour had passed, I reached Zumstein, a picnic and camping ground noted for the presence of large numbers of kangaroos (most of which hang out around the picnic tables, hoping you’ll ignore the “don’t feed the kangaroos” signs). 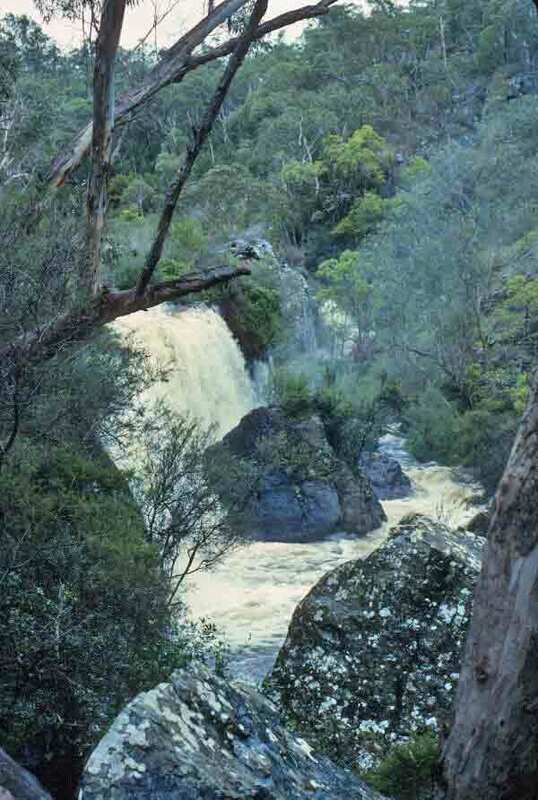 Continuing on the Zumstein-Halls Gap Road, climbing ever higher, I soon came to the MacKenzie Falls turnoff. I parked the car and set off on the long, steep, wet hike to the falls. The first falls to come into view were the magnificent Broken Falls. I stopped to admire them, and then hiked on through the dripping, green woods and lichen-stained boulders. The abundant recent rain has caused the rivers to rise dramatically, so half an hour into my hike I found the path completely submerged, and I had to turn around and head back without seeing MacKenzie Falls–though I hardly felt cheated, since Broken Falls were so lush. Plus the track itself was quite wonderful, with abundant greenery, wildflowers, and lovely little gray, brown, and white hummingbirds.